Clear Creek, the largest waterway on the ranch, has it’s origins in the southern reaches of the Bighorn Mountains in the Cloud Peak Wilderness. 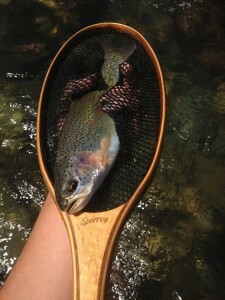 Last weekend, Charlie headed up into the mountains to the North Fork of Clear Creek (nearly 50 miles upstream of Ucross) to do some fishing and thinking – check out that beautiful trout! While all our research to date has been focused on the ranch, we are keenly aware of the connectivity between the dry, rolling, high plains, and the rugged mountain ranges. These nearby mountain systems provide the snow pack that keeps streams, rivers, and creeks flowing year round, provide source habitat for many wildlife species that also rely on open areas of the high plains, and provide recreation and timber resources for residents, and visitors from around the world! We are actively pursuing opportunities to expand the vision of our project to encompass the ecological continuum from the high plains, to sub-alpine forests, and alpine environments in the Bighorn Mountains. Next week, we’re sitting down in the Raymond Plank Creative Center with administrators of Spear-O Wigwam – the mountain campus for Sheridan and Gillette Colleges – to discuss collaborative opportunities for educational programs, field research, mapping, and community outreach. Spear-O is set on the Park Reservoir in the northern Bighorns, 20 miles from pavement, at a beautifully restored mountain ranch. It is outfitted with bunkhouses, a fantastic lodge, and a new classroom/science lab. Cool fact – Ernest Hemingway wrote ‘A Farewell to Arms’ in one of the bunkhouses! Check out their website at sheridan.edu/site/spearowigwam.